This case investigates the impact of climate change on conflict in Sri Lanka, namely in the northern and eastern regions which have faced the most ethnic and political instability since Sri Lanka gained independence. Climate change will have a significant impact on the precipitation and temperature levels in Sri Lanka, which in turn will negatively impact agriculture and cause population displacement. These factors will culminate in the escalation of ethnic conflict between native Sri Lankan Sinhalese and the Sri Lankan Tamils who descend from Indian immigrants brought by the British Empire as labor. Recent conflict history strongly suggests that the region will remain unstable regardless of the climate implications, so in this instance climate change will work as a multiplier to conflict rather than as a primary driver. Sri Lanka has seen significant changes in climate over the past hundred years. Interestingly, this has manifested itself in a slightly different manner than is normally expected when one discuses climate change. Total rainfall has fallen over the past sixty years, while flooding increased dramatically over the same period of time. This inverse relationship can largely be attributed to an increase in intense weather events which are hard to prepare for. Future models predict an increase in frequency and intensity of extreme weather events which will cause flooding in both coastal areas and inland. Sri Lanka has seen a great deal of domestic conflict over the past sixty years, though most has been politically driven. There have been a series of civil conflicts stretching back to the end of British colonial rule, each growing in intensity. The most recent conflict ended in 2009, however protests against how the government used force during the civil war still continue, and the Northern provinces of Sri Lanka remain politically unstable. Climate change has been affecting Sri Lankan seasonal weather patterns in a very distinct manner over the past several decades. First, it must be understood that Sri Lanka has a two part weather cycle, like most of the other nations in this region of the world. Heavy rains fall in the monsoon season, followed by a dry season that takes up the rest of the year. This pattern repeats annually, and as a result the primary crop in Sri Lanka is rice, which is able to withstand the heavy periods of rainfall, and stores quite well through the dry season. However, the intensity of the two seasons has increased dramatically over the past several decades. The monsoon season is seeing more and more rain than ever before, flooding the paddy fields to a point that the water resistant crop can no longer be grown and the heaviest floods have destroyed vast quantities of stored produce. The dry months which follow are increasingly more arid, causing widespread drought and consequently killing the dry season crops which help sustain the rural population. Further to this, there has been an increase in extreme weather events such as cyclones, tsunamis, and tropical storms which cause extreme short term flooding which decimates infrastructure and leaves a great deal of standing water in previously dry areas. The flooding has three primary consequences. First, as discussed, agricultural output is reduced and consequently farmers who no longer live in farmable areas must move to more fertile regions. Also, the decrease in the quantity of food available causes civil unrest as families starve. Second, there is an increased prevalence of vector waterborne disease such as cholera and malaria which both displaces the population and increases civil unrest. Third, the floods themselves cause vast domestic migration to less affected regions, often towards regions where there has already been prolonged ethnic conflict and unrest. The combination of population displacement to more volatile regions and the increased civil unrest as a result of not only displacement but also disease and food shortages has an aggregate negative effect on political stability in the effected regions. Simultaneously, civil unrest as a result of starvation, population displacement, and disease leads to an increase in the ethnic tensions between the Sinhalese and Tamil elements in the North East. Tamil refugees forced to the region have an increased likelihood of joining the insurgent elements, thus prolonging the ongoing conflict between the state and the LTTE. Consequently, the ethnic conflict amplifies the political instability in the region, allowing the insurgent groups to gain a stronger foothold and thus continue the civil conflict. Also active in this model, though not shown explicitly, is the increased foreign support for the Tamil minorities as the destabilized government mismanages the environment crises that endanger its citizens, and enact war crimes against both the LTTE and occasionally their own citizens. There is a feedback loop here whereby the civil unrest which is feeding the ethnic conflict is further increased by population displacement caused by the violent conflict in the region. Another feedback loop exists between violent conflict and political stability itself, with conflict decreasing political stability and decreased political stability, increasing violent conflict. A similar loop exists between ethnic conflict and political stability. The primary overlapping sectors in the diagram are that of Social and Political/Violence. The term 'Civil Unrest' could easily fall into either of these two categories, though for this case study I will be categorizing it as Political/Violence since there are more logical partners in the latter group than the former. Ethnic and violent conflict have been separated because each will retain a separate correlation with political instability, though both will increase. It is likely that ethnic conflict will see a sharper increase as political instability increases, while violent conflict will increase with lesser rapidity and intensity as it may take time for conflicting groups to organize and mobilize. Conflict began when the British Empire brought Tamils from India to Sri Lanka in order to create a more skilled workforce on their plantations in the 1800s. However, full scale conflict did not occur until 1983, when the LTTE was able to consolidate pro-Tamil separatists into an organized front and bring about civil war. The conflict was brought to an official end in 2009, but there is still no resolution to the divisions between Tamil and Sinhalese Sri Lankans. South Asia, East and North Sri Lanka with spillover in central and north eastern regions. 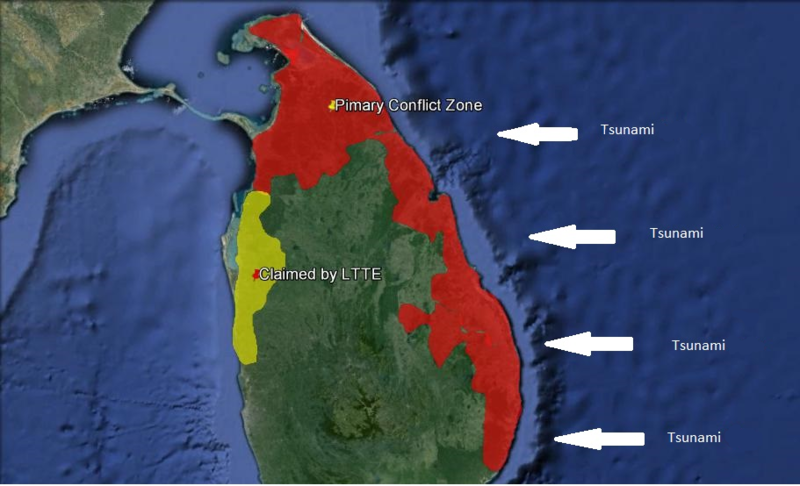 Figure 3 outlines the primary conflict zones in red, with the yellow zone indicating a zone claimed by the LTTE but never hotly contested. There has been spillover into many other regions of Sri Lanka, however for the sake of identifying the zones most likely to see cross-over between climate and conflict I have only highlighted the zones which are more coastal or have seen the highest concentration of conflict. The white arrows indicate the direction tsunami waves come from, outlining the vulnerabilities of the conflict zones to extreme weather events. Sri Lankan civilians, especially those employed in agriculture in the east and north, Sri Lankan military, Sri Lankan government, Indian government and military, Tamil separatist groups including the LTTE. Sri Lanka will continue to face three primary climate threats over the next several decades. First, an increase in the intensity of extreme weather events will cause vast destruction along the east coast of Sri Lanka, decimating arable land and salinizing the soil as sea water is brought farther inland than ever before. The first threat will be an increase in tropical cyclones which both destroy infrastructure and cause flooding on arable land. This decade Sri Lanka has seen high levels of flooding almost every year, with a number of extreme weather events causing widespread population displacement and destruction. The second, more long-term, threat climate change brings is that of rising sea levels. Sea level in South Asia is predicted to rise by up to 1m over the next few decades, and since 1900 has risen by 200mm. Increasing temperatures melt ice caps and glaciers and will inevitably cause sea levels to continue rising. 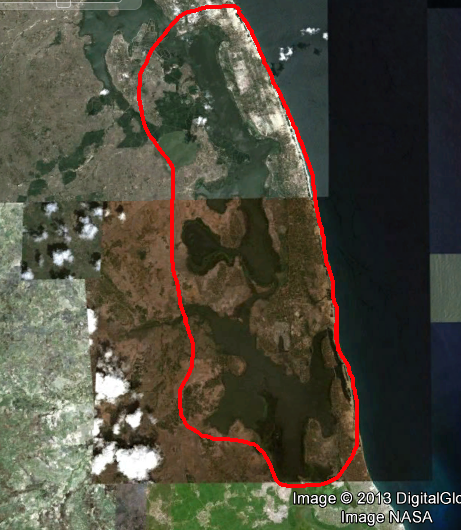 Sri Lanka's topography multiplies the negative impact of rising sea levels as some of the most conflict vulnerable zones in the country are located in low altitude coastal regions. The third and probably most potent threat is that of increasingly intense monsoon events. The monsoon season is split into a wet/dry cycle which dictates the agricultural output of the Sri Lankan farming industry. The wet season lasts from December to March in the northeast of the country, with the remainder of the year being dry. However, climate change is changing this cycle, intensifying it gradually to increase the quantity of precipitation in the wet season, and severely decrease the quantity of precipitation in the dry season. These opposite shifts are leading to decreased agricultural output as arable land becomes washed out in the wet season, and drought in the dry season leads to extended periods of no productivity. A secondary threat, and one that is harder to view as a threat currently, is that of rising temperatures. The most recent IPCC report states that there has been an increase in regional temperature by 1.5°C over the past century, and is likely to continue increasing over the next century at a faster rate. The environmental implications of this are threefold. First, an increase in temperature will also increase the active season of mosquitos and other disease vectors which will promote the spread of malaria and other vector borne diseases for longer periods of time. Second, the temperature increases may have an impact on agricultural output, though this is more difficult to measure and is certainly less impactful than severe changes in seasonal precipitation. The final factor is wind speed, which has the potential to increase the destructive power of storms and increase the size of swells when there is coastal flooding. Increases in temperatures in the Pacific Ocean will have a multiplying effect on wind speed and subsequently the size of these storm swells. Sri Lanka has a diverse range of habitats, ranging from tropical to semi-arid and the weather cycle is dictated by a monsoon cycle with a wet and dry season. Moderate temperatures year round. Volcanic island, one area of high altitude in center of country. The Northeast and Southwest are semi-arid, receiving the lowest quantity of rain, followed by the north and east which are still dry relative to other regions. The primary act and harm sites are located within the Northern Province, Eastern Province, and the northerly areas within the North Western Province. However, there may be spill over into the North Central Province in the future as conflict escalates. Past conflict in Sri Lanka has been on the national level between the Sri Lankan government and the LTTE, a separatist Tamil group. However, the conflict is extended by various insurgency groups acting indepedently of the LTTE, and now that the LTTE has been defeated there is a high likelihood many various factions will fill the space in which the LTTE used to preside. India sent a peace keeping force to assist the Sri Lankan government, which ended in the deaths of over 1,000 soldiers. The peace keeping force was sent after an accord between Sri Lanka and India that was supposed to bring about the end of the Tamil insurgency. In response to Indian involvement in the conflict, the Prime Minister Rajiv Ghandi was assassinated in 1991. High level of conflict in concentrated areas, no conflict at all in many of the central and southerly regions. Civilian Casualties: Unknown, it is believed 40,000 were killed in the final five months of the conflict alone though this was a rough estimate provided by the UN mission in Sri Lanka. Sri Lanka has a complex collection of cultures which have come into contention with one another since the country was known as Ceylon. The British Empire helped ignite the ethnic tension into true conflict by forcing migration of Indian Tamils to the plantations in Sri Lanka in order to boost their own economy. For a great deal of time the new Tamils did not come into direct heated conflict with the native Ceylonese because of the protection afforded them by the British imperial rule, which saw the Tamil workers as vital to the production base Ceylon had to offer. However, upon the exit of the British Empire the Sinhalese majority took their newfound independence and used it to isolate the minority Tamils in response to the preferential treatment that was afforded to them for so many years under British rule. Sinhala was made into the official national language and Buddhism its national religion, exacerbating tensions between the two groups and further disenfranchising the Tamil people from Sinhalese rule. Without true representation in the government, the Tamil populations in the North and Eastern Province were unable to lobby effectively for support of their communities when natural disasters struck. The lack of interest by the dominant political parties in the livelihood of some Tamil communities meant that the consequences of drought and flooding were slow to be dealt with, and refugees from such disasters were met with relative distaste by some elements of Sri Lankan society. In response to these growing ethnic tensions a number of pro-Tamil insurgency groups were born which would eventually combine to form the LTTE. One of the primary overlaps between the environmental and conflict aspects of this case is the vast destruction both the conflict and climate change has inflicted upon critical infrastructure for the production of food. 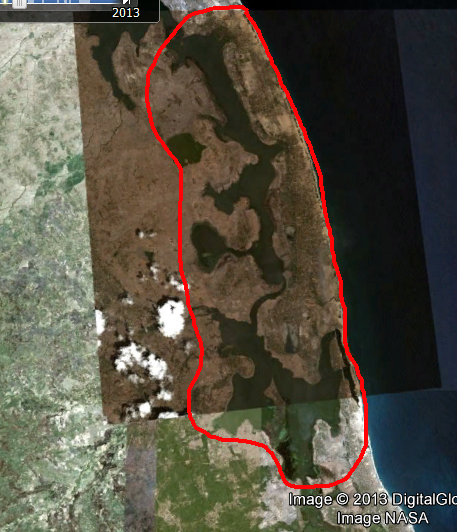 Satellite images from the same season in 2009 and 2011 can show us the fluctuation in water levels in just a short space of time. Coastal flooding like this is becoming a norm in Sri Lanka, and because of the coincidental location of the majority of the nationâ€™s Tamil population it is very difficult to separate the influence of food shortages and population displacement because of natural disaster from increases in civil unrest and consequently civil conflict. After the 2011 floods in Sri Lanka an estimated 20% of Sri Lankan harvest was lost due to torrential floods and precipitation, with over 200,000 acres of rice fields destroyed by the flooding. Batticaloa, a city in the Eastern province, and its surrounding territory have been hit incredibly hard by extreme weather events, with up to 900,000 people affected by the floods in that province in 2011, severely disrupting economic activity in the area. Some local estimates stated that 90% of local agricultural production was affected by the 2011 floods, and a great deal of cattle which the locals rely upon for income were also lost in the flooding. This, paired with the growing intensity of the monsoon cycle, has led to a dramatic reduction in the general economic output of the region with few insights into the longer term consequences these persistent climate events. It is likely that there will be population displacement as a result of destroyed livelihood, and since this region has a 50% Tamil populuation, there is a high likelihood that those being displaced will be Tamils. If there is enough insecurity within the displaced populations it will leave them vulnerable to exploitation by Tamil separatists, meaning we will potentially see an increase in conflict levels in coming years. Post-conflict Sri Lanka has performed very well economically, however there has been growing worry over the food production capabilities remaining in the Northern Province, as well as the capability of the provincial government to handle the hundreds of thousands of refugees who have moved back to the Northern Province since the end of the conflict in 2009. The wealth being generated by Sri Lanka is not coming from agricultural sources, and the sources of conflict will not likely be those who are working in secure jobs in the metropolitan areas of the country. The more likely scenario is that already poor laborers in agriculture will be gradually forced out of their land as the monsoon season continues to intensify, resulting in a need for either the market or the government to provide an escape mechanism for the people. Should this fail to occur, it is likely that civil disobedience will increase, and calls for a resolution to the Tamil-Sinhalese conflict will become strong once again. Sri Lankan Government defeated the LTTE after a prolonged conflict and many military and civilian deaths. There was no resolution with still unhappy members of the Sri Lankan Tamil community, though there haven't been major reprisals since these conclusion of the conflict in 2009. It is likely that there are still insurgent groups active in Sri Lanka but they lack the funding and public support to take serious action against the state.